Announcement Collectible one of a kind art dolls, fantasy inspired and Waldorf style cloth dolls, heirloom quality wool stuffed animals, miniature dollhouse dolls, and doll pins. All dolls found here are designed and handmade by me using my own patterns and eco-friendly natural fibers and fabrics. Collectible one of a kind art dolls, fantasy inspired and Waldorf style cloth dolls, heirloom quality wool stuffed animals, miniature dollhouse dolls, and doll pins. 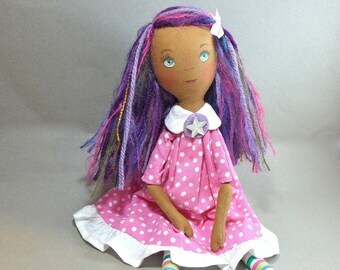 All dolls found here are designed and handmade by me using my own patterns and eco-friendly natural fibers and fabrics. This beauty arrived this afternoon and I can't stop gazing at her and discovering new details to admire. She is just stunning and so precious and I feel so very lucky to have her here. Thank you for sharing your wonderful artistic gift with us, your craft brings such joy and light to our world. This is so beautiful and whimsical! I have been looking at these doll pins for months, and the only reason it took me so long to buy one is that I could not make up my mind on which one to get! This can be pinned to a jacket, t-shirt or even a hat! Wow! The doll is so beautiful. I'll definitely be back for more! I 100% recommend this shop. Beginning again! Time to make some more holiday dolls! Tiny sweater hand knit for a tiny doll! Spring is in the air here at The Nest! The Fairies Nest home to original cloth dolls from the Lands of Story and Enchantment! I have been a doll maker seriously and professionally for more then 25 years; a skill developed from an acute fiber addiction that I inherited from my mom; an overactive imagination, reading lots of fantasy, and a refusal to "grow up" and stop playing with dolls! I've always been interested in needle crafts of all kinds and have spent many years experimenting and learning how to manipulate cloth and fibers; sewing, spinning, knitting, if it has to do with fibers I've tried to learn it. Each of my dolls requires many hours to make as I design and create each doll completely from my own imagination. Many of the dolls are made from the inside out without patterns and all have faces carefully drawn and painted by hand using no patterns or stencils. Because of this, no two dolls are EVER exactly alike, they are all one of a kind; like people, each has its own distinct personality. I would be happy to make a special fairy for you or to arrange a payment plan so please contact me with your questions. I am a Froud Artist of the month and my dolls have been featured in several issues of "Art Doll Quarterly" magazine. Welcome to The Fairies' Nest, home to original one of a kind cloth art dolls... all designed and handmade by me!